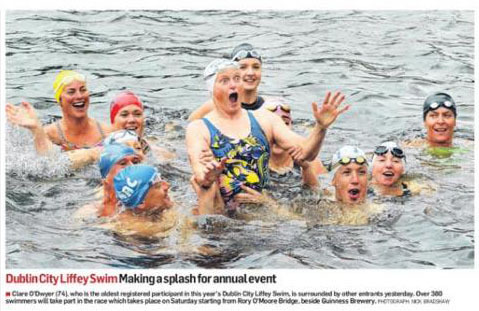 2019 will mark the 100th Dublin Liffey Swim. The swim will take place on Bank holiday Saturday 3rd August. Provisional times are 12 noon for the men's race and 1 pm for the ladies. Number of qualifying swims needed to enter this race is likely to be higher this year! IMPORTANT! No new swimmer will be permitted to race without a race number. This number will identify that swimmer for the season and subsequent Seasons. Swimmers may attain a race number by registering online with How Did You Swim.com before their first race. If you registered in 2018, your race number will be same for 2019. Then all you need to do is login to HowDidYouSwim.com using the email address and password you used to register last year and re-validate your 2018 race number. Races can be cancelled at short notice due to inclement weather and tides. Keep up date with changes follow Leinster Open Sea Swimming on Facebook. If you have any questions on races please email leinsteropensea@gmail.com. To keep up to date with our club's sea swimming activities, follow us on Facebook!